Update October 31, 2018: Blockchain venture production studio ConsenSys, Inc. has acquired the pioneering space company Planetary Resources, Inc. through an asset-purchase transaction [link]. For a while, Planetary Resources was a bit in limbo (what happened to the deep pockets of wealthy individuals that were there back in 2013?). I am not so sure what to make of it. People are applauding the combination of Asteroid Mining with Blockchain technologies. The hyped link here is a bit fake imho. It is just two extremely exciting technical fields amongst others like: artificial intelligence, neural networks, biogenetic engineering, machine learning and I am sure to miss out on some of the other singularity related fields. Of course in the far future, in the space based economy, payments for services (such as asteroid mining) will be done based on blockchain technologies, but that is not specific to asteroid mining as such. Also on Earth this will be the way we are going to do payments in the (near) future. Yes, I am a believer in decentralized, depoliticized value tokens where individuals, companies and governments can exchange value. This is one of the reasons I initiated the Bitcoin Space Education Fund (BSEF). 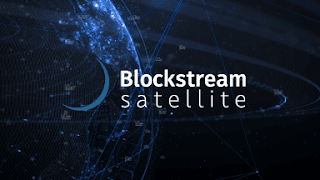 A true link between blockchain technologies and space is really happening in the SatCom field where QKD (Quantum Key Distribution) could be performed, on a global level to make ultra-secure communications and then of course also ultra-secure payments. Also with IOT nanosatellites upcoming, there is a more logical link to do something with blockchains. But asteroid mining and blockchains? Just the addition of 2 buzzwords in 1 sentence for now. 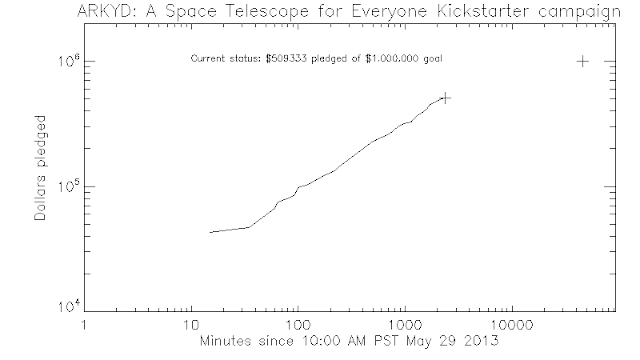 Update July 1, 2013: Planetary Resources made their kickstarter work! A whopping $1.5M for getting your own space selfie done from orbit! Today, May 29, 2013, asteroid mining company Planetary Resources kicked-off their crowdfunding effort to raise one million dollars from the general public. Main objective is to increase the level of participitory exploration for their operation by giving access and control of a future space based observatory in the hands of virtually anybody. By itself a great idea. I believe such initiatives can really help raising the awareness of the general public about the wonders of Space Exploration. On the other hand, the project is already backed-up by a full list of wealthy individuals so it is not your classic poor dude in a garage with a great idea in need of seed money to survive. So I am still contemplating on putting my money into this great idea. 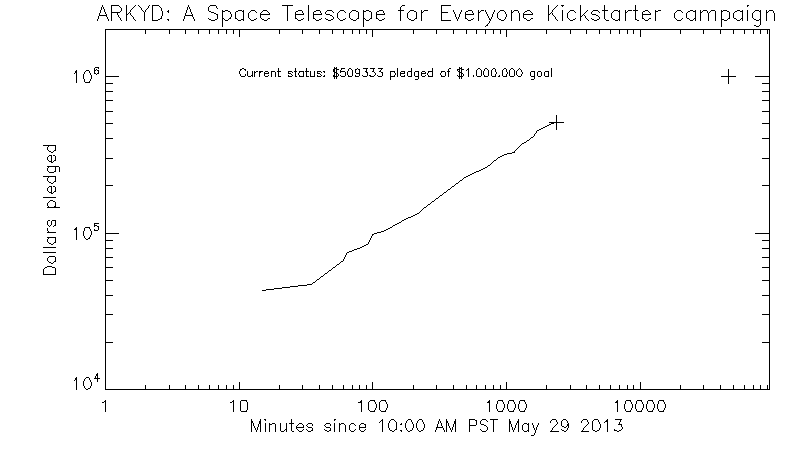 Below is a figure of how the crowdfunding campaign has lift-off since the start at 10:00 AM PST on May 29. The data untill now show that it is going into the right direction. 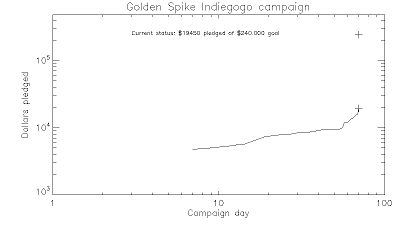 In any case, better than what the Golden Spike Company pulled of on their Indiegogo campaign, reaching only a little under k$ 20 with a target of k$ 240. 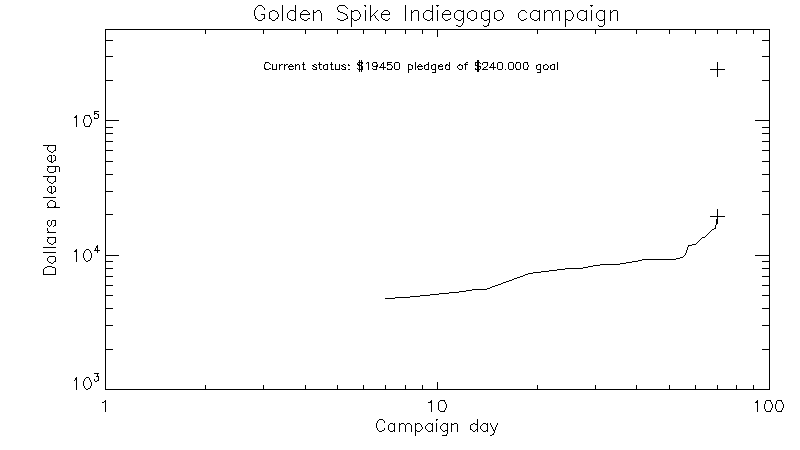 See graph below for how their campaign did not succeed. And talking crowdfunding campaigns for Space: anyone knows what happened with the SpaceCapsule1 campaign?